Under the rule of Emperor Claudius II, Rome was involved in many very unpopular campaigns. Understandably, “Claudius the Cruel” had a tough time getting soldiers to join his military leagues. He believed the reason was that Roman men did not want to leave their wives and families. As a result, Claudius cancelled all marriages and engagements in Rome. Saint Valentine was a priest in Rome at the time. He and Saint Marius aided the Christians by secretly marrying couples. For this kind deed Saint Valentine was apprehended and dragged before the Prefect of Rome who condemned him to death. He was martyred on February 14, about the year 270. Legend also says that Saint Valentine left a farewell note for the jailer’s daughter, who had become his friend. He signed it “From Your Valentine.” Pope Galasius set aside February 14th to honor St. Valentine. Gradually, February 14th became the date for exchanging of love messages and St. Valentine became the patron saint of lovers. The date was marked by sending poems and simple gifts such as flowers. Good Morning Amsterdam today interviewed the Hotel Director and his wife who is the Guest Relations officer. They actually got a divorce many years ago so that they could work on the same ship because the company policies at the time forbade it. Once the policy was changed to allow couples to work on the same ship they were married again and they have worked with Holland America for the past twenty years. When we returned to our cabin we discovered that the cabin steward had not only cleaned the cabin and made the bed but he left Valentine Day surprises. 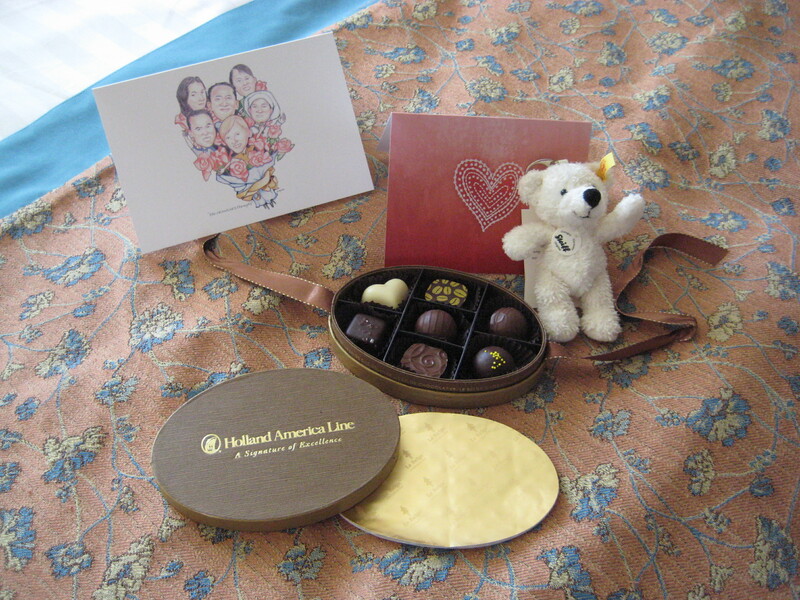 We each received a beautiful oval gold box of chocolates and a small white teddy bear. Bill Crews lecture today was titled: The Pacific War Comes to Sydney. Bill recounted the events of late May, 1942, when three Japanese midget submarines entered Sydney Harbor, inflicting considerable damage and loss of life. This caused great anxiety in the Sydney community. The circumstances were eerily similar to those of Pearl Harbor, where obvious breaches of security and warnings of doom were ignored or discounted. In the afternoon we attended a wonderful singing and dance showcase titled: Love in the Afternoon. The Amsterdam singers and dancers performed a variety show of songs with love themes while Bruce, the cruise director, hosted the event and included many famous people’s thoughts and comments on love. It was a very entertaining show and the cast received another standing ovation. It was another formal night, and being Valentines Day, we dressed up in our tuxedos with red bow ties and cumber bunds. 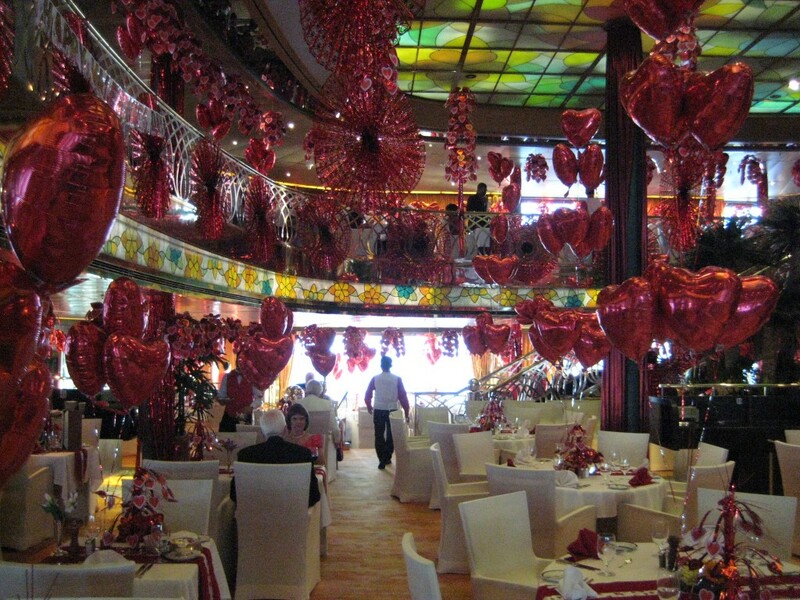 The dining room was decked out with an incredible over the top amount of red and white Valentines Day decorations. Every chair was slip covered in white, the tablecloths were white with and red and white heart printed runner, red and white napkins, every table had several heart shaped Mylar balloons, and this was just the tables. The room had Valentine Day banners, red metallic streamers, hearts, balloons, and tons of hanging party decorations for the occasion. After dinner there was a Valentines Day Ball in the Queen’s Lounge. The show lounge was decorated with just as many decorations as the dining room, with red and white, everywhere. They gave away a variety of prizes including one grand prize to the person who guessed the closest number of red confetti hearts that were in a champagne glass. The small fluted glass had over 10,000 confetti hearts and the man who came the closest to the correct number of hearts won a variety of merchandise including internet time, gift shop items and spa credit. Lunches—So that Kent wouldn’t gain 100 pounds on this cruise, his doctor recommended he eat oatmeal and fruit in the dining room at breakfast; salad in the dining room at lunch, and most of his dinner at night. Avoid the buffets and don’t eat the usual 3 deserts a meal. So to make lunch more interesting, we invite people we see who are HOT! or look interesting, to have lunch with us on sea days. This week we had lunch with Ana (81) who lives on Long Island and has a home on Fire Island (the Pines) and in Ft Lauderdale. She is a go-getter and takes photos, dances, takes tours and loves her Ipad. We also invited Ingrid and Alec to lunch. They live in separate states, but have been friends for years. Not sure what their stories are, but will find out next time. Soon we will invite Jenn (under 40) and her 83 year old aunt to lunch with us. After that, Blair and Marie, whose grandfather started the BVD underwear company. They are from Ottawa. Marie is a fashion plate and enjoys a cookie or two with Kent. Departures—Tomorrow Tom, from Lake Como, and Matthias and Alain from Stuttgart will disembark in Sydney. We will miss their company! Perhaps we will see them this summer when we head to Italy and Germany for a wedding. However we are scheduled to get about 200 new passengers when we leave Sydney. News—Thank God for CNN. Their international news division has “balanced” news and special programs about interesting places around the world. This keeps us somewhat informed about what is going on. We also have the NY Times Digest which is an 8 page condensed daily newsletter with US news articles. Kent reads it cover to cover to help stay current. Fox has its own satellite and we could watch it for “variety,” but don’t…very often. We’re so grateful we are not on Carnival’s Triumph! That would be a much different experience than on the MS Amsterdam!